The whole reason we started this site was to provide the small candy maker, the lesser known makers of all things sweet, a site that celebrated their wares. We seek confections that you, fair reader, may not find at your local corner shop, but that you can procure on the world wide web of internets. Lately I’ve been all Japanese umami gummy sour on your asses. Well today, I’m writing about some super high-end artisanal chocolate from Ritual because, it’s been awhile. Cue over-played 90’s emo Staind song. I apologize in advance if this gets verbose. I had like maybe 1/3 of the bar and I’m super high. Like caffeined out of MY HEAD. I won’t sleep for days. The chocolate has such great deep coffee flavor — like the flavor of that perfectly percolated strong cup of morning joe you get when you’re waiting for that 3 egg omelette loaded with bacon and cheese to get you over the 4 whiskeys you downed the night before. But in chocolate. Just for the record – I freaking love coffee. Always have. I drink it strong. I live in San Francisco where we take it very seriously. Ritual’s Novo Coffee has the right tone – it’s not a hint of what coffee sorta tastes like, like what you expect of a coffee ice cream. 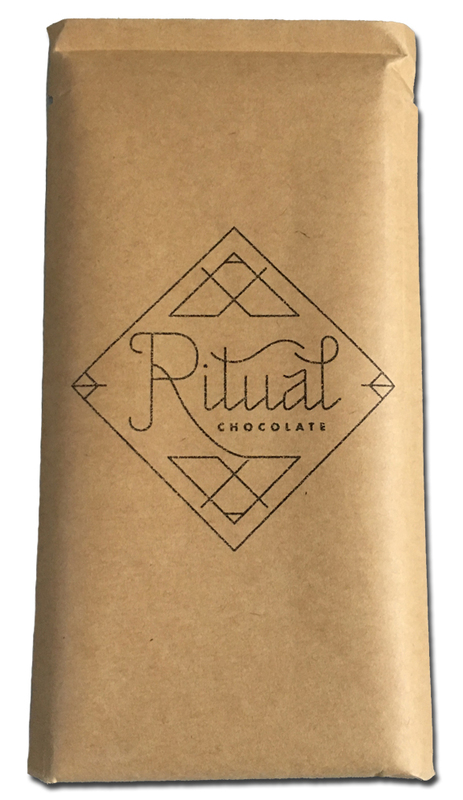 Ritual’s chocolate is crisp, slightly bitter as dark chocolate should be, and filled with loads of different notes. I taste berry and earthy, nutty flavors. The sweetness cuts through the bitter so you know you’re eating dessert, but the depth of the coffee really feels like they poured a perfectly brewed pot into the bar itself. This is the kind of bar that would make a great companion ingredient to an awesome dessert, like a high-end butterscotch pudding or shave it over homemade vanilla ice cream. Look, I ain’t going to tell you what to do with it – but chefs: if you’re cooking with chocolate, try this bar out in a few recipes. The only reason I take a half star away is these Ritual bars ain’t cheap. Each bar is a whopping 9 bucks, and if you’re trying to save the environment, perhaps there’s a tad too much packaging, no matter how gorgeous it is. Yet. 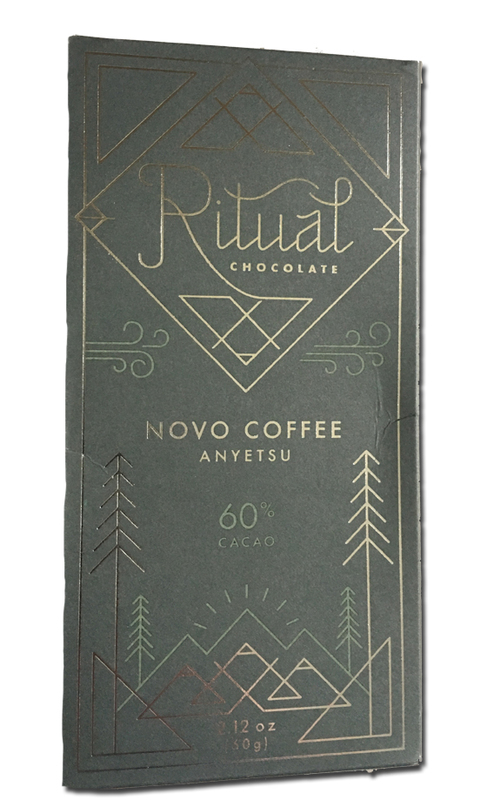 If for some reason you equate the chocolate of a Hershey bar with what you think all chocolate tastes like, go get you some Ritual Chocolate’s Novo Coffee bar and get those taste buds awakened. A few extra notes: the company doesn’t call these organic but its ingredients are tight, and 2 of them are organic: Cacao, Organic Cane Sugar, Organic Cocoa Butter, Coffee. Also, these bars are made on machines that also process peanuts, tree nuts and wheat.